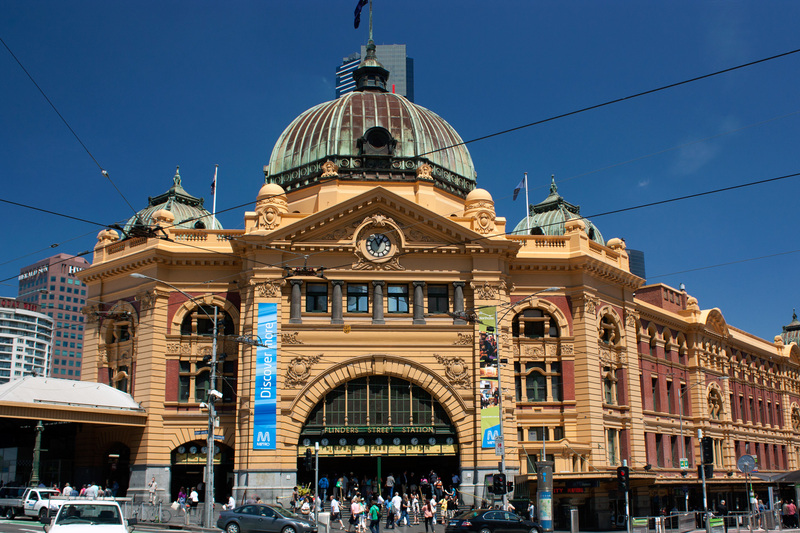 Flinders Street Railway Station is a historic building in central Melbourne, Australia. It is a major railway station located on the corner of Swanston Street and Flinders Street. 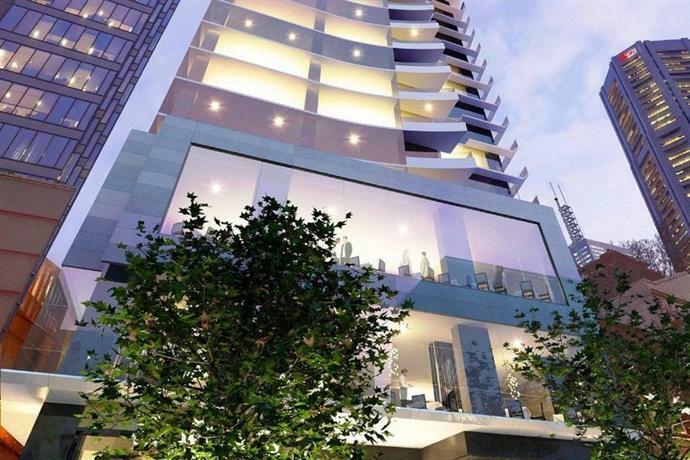 This huge building takes up two city blocks and lies between Swanston and Queen Streets. There are no less than fourteen platforms, one of which, at 2,323 feet, is the fourth-longest platform in the world. 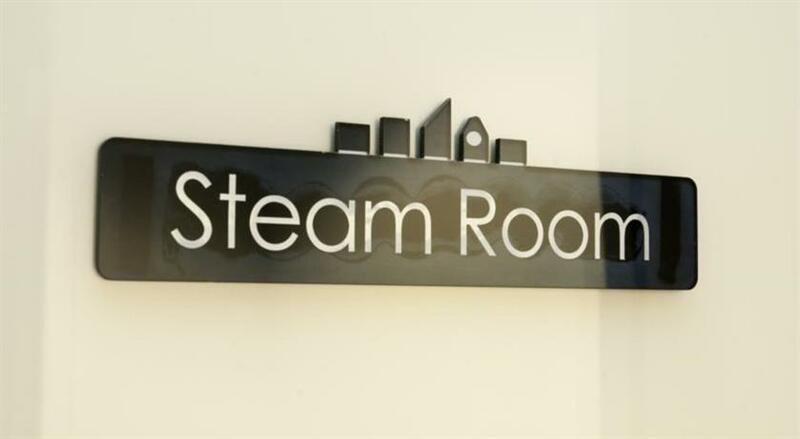 Serving the entire metropolitan area, the railway station is an iconic building in the city and a popular meeting place. More than 90 million passengers pass through the station each year. On a daily basis, it handles 1,500 trains and 110,000 commuters. It is an easily recognizable building, with its arched entrance, green copper dome, yellow façade, tower, and several clocks. 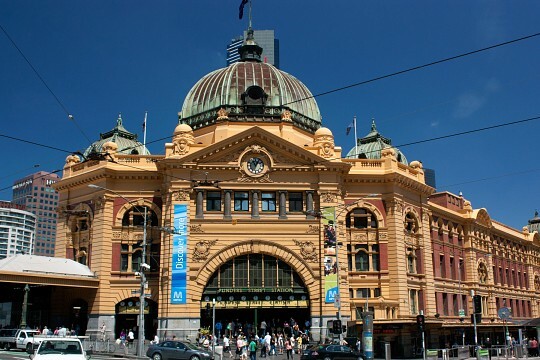 Flinders Street Railway Station is probably the most famous building in Melbourne. 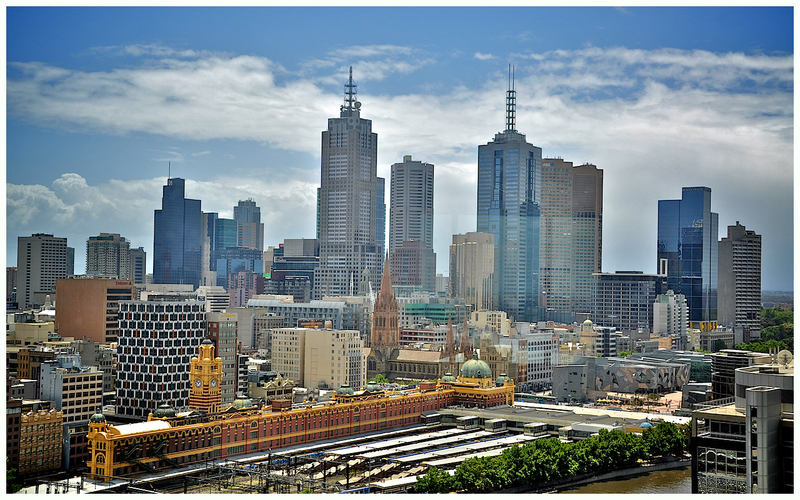 The Melburnian saying, “I’ll meet you under the clocks”, comes from the rows of clocks above the main entrance. These clocks indicate the departure times for each line. “I’ll meet you on the steps” is another saying, referring to the stairway underneath the clocks. 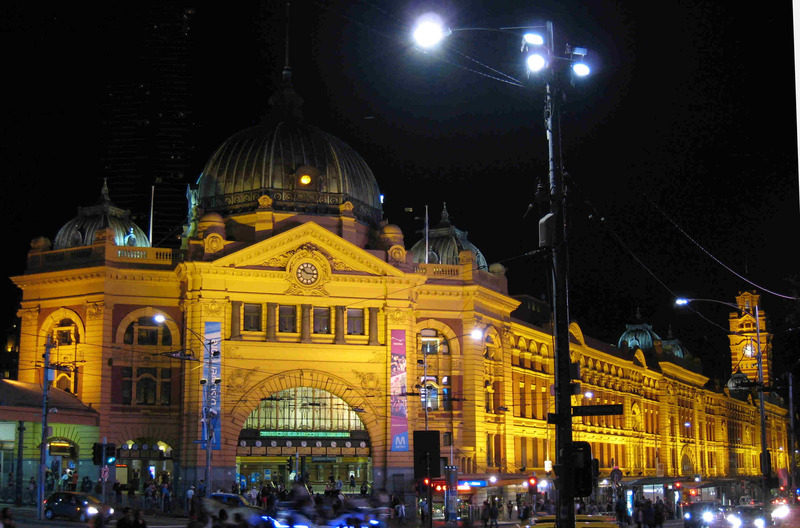 Flinders Street Railway Stations is a Victorian Heritage Site. The Melbourne Terminus was the very first train station on Flinders Street. It was a collection of train sheds and was opened in 1854. This terminus was the first train station in Australia. The opening of the station was combined with the country’s first steam train ride. 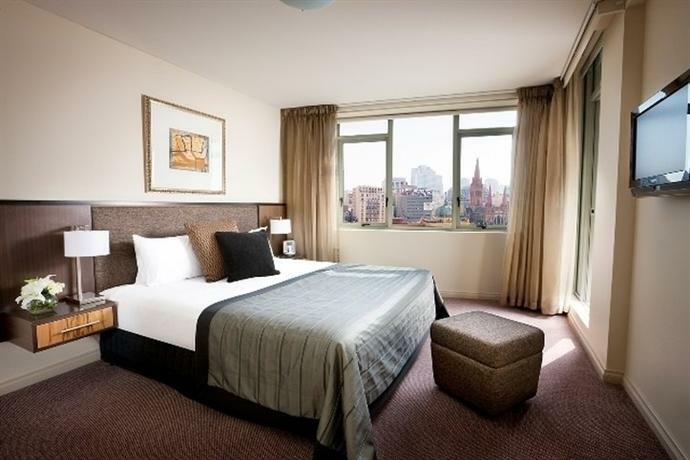 It was located on the corner of Swanston Street and Flinders Street, next to the fish market. An extra platform and two pedestrian bridges were added in 1877. In 1879, wooden and iron buildings and a telegraph station were built. The first signal boxes, on each end of the platform, were taken into use in 1883. A third platform was constructed in the 1890s. The government wanted to build a new railway station to replace the ad-hoc building in 1882. They organized a design competition, which was won by the railway employees, James Fawcett and H.P.C. Ashworth. They named their design ‘Green Light’. It consisted of a French Renaissance style building with a dome and clock tower. Construction started in 1900 and the foundations were finished by 1903. In 1904, in the middle of construction, the plans were heavily modified. It was decided not to build a concourse roof and to add a fourth storey. Work on the actual station began in 1905. Flinders Street Railway Station was officially opened in 1910. 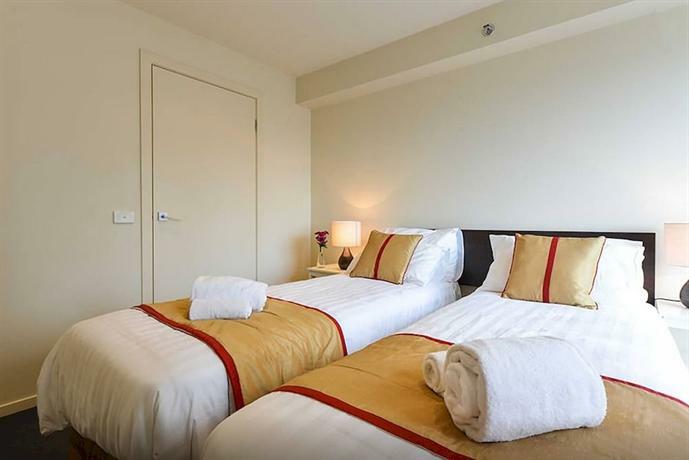 The building has three storeys at the concourse near Swanston Street and four storeys at the platform end at Elizabeth Street. The first electric train ran from Flinders Street to Essendon in 1919. 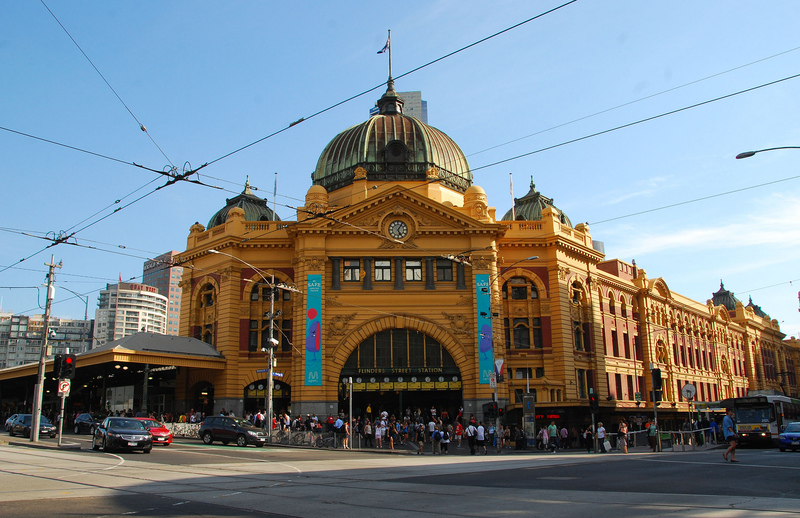 In 1929, the Flinders Street Railway Station was the busiest train station in the world. Food stalls lined the concourse, while the upper floors were built to house a gym, library, and a lecture hall. 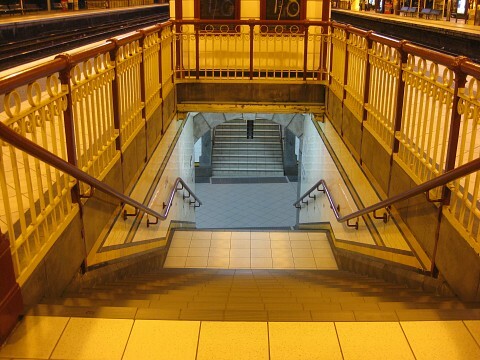 In the course of the 20th century, Flinders Street Railway Station was redeveloped and refurbished several times, not always with the content of the public and historians. 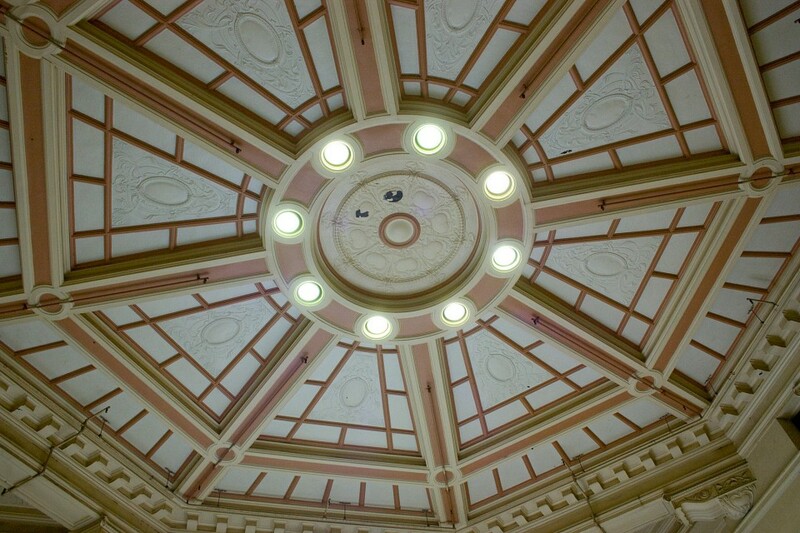 The striking clocks under the dome and above the main entrance date from the 1860s. 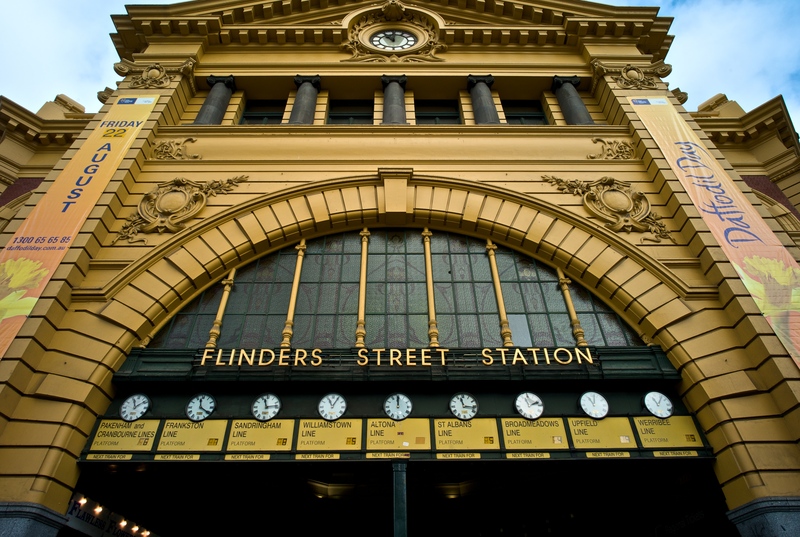 No less than 60 Bathgate clocks were bought in England to be used at the stations at Flinders Street, Spencer Street, South Yarra, and Richmond. Before the old station at Flinders Street was demolished, the clocks were safely stored away. 28 of them were added to the new station in 1910. The clocks were operated by an employee, who used a long pole to change the time. Each day, the clocks were changed about 900 times. 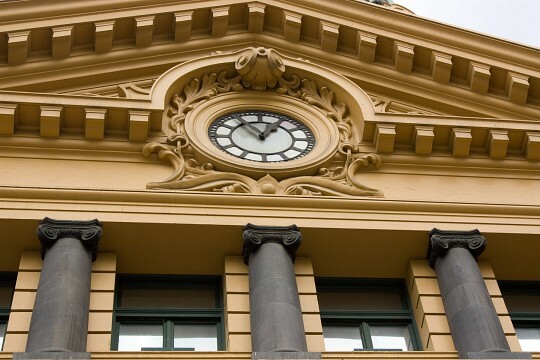 In 1983, the original clocks were removed during a renovation project and replaced by digital clocks. This was met by public outrage and protests, and the clocks were added back one day later. The clocks at the main entrance are now operated by a computer, while the ones at Degraves Street and Elizabeth Street were replaced by airport-style, split-flap, display clocks. Another large train station in Australia is the Central Railway Station in Sydney, which is the largest one in the country. 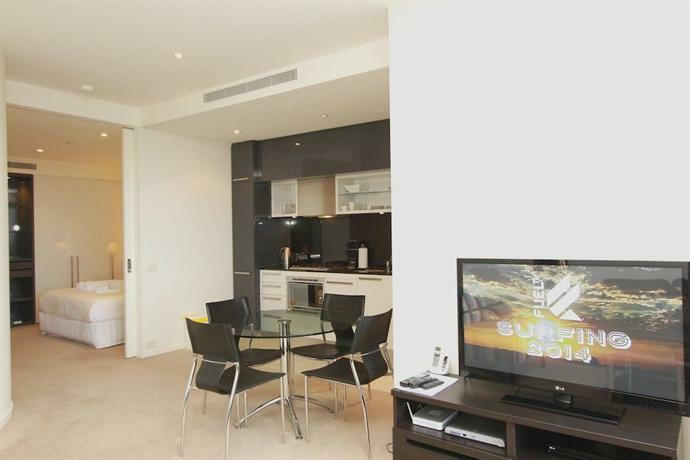 Additionally, Circular Quay is also a major transportation hub in that city. Australia is home to some epic train journeys. There is, however, another massively impressive Melbourne train station: the futuristic Southern Cross Station, formerly known as Spencer Street Station. The Ghan runs through the Outback and Red Centre from Adelaide in South Australia to Darwin in the Northern Territory. The Indian Pacific crosses the country from east to west, from Sydney to Perth, calling Adelaide on its way. 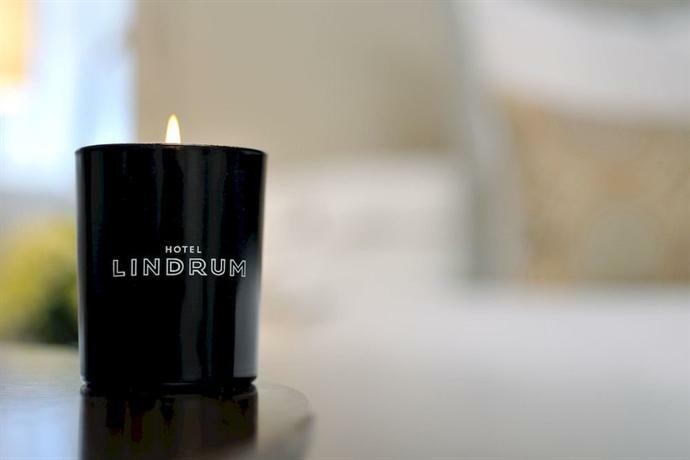 This epic journey runs through the vast Nullarbor Plain. Other iconic railway stations in the world are Grand Central Station in New York City, Central Train Station in Antwerp; Belgium, St Pancras railway station in London, Atocha Station in Madrid; and Union Station in Washington D.C..